Alfred Jacob Miller was born in 1810 and raised in Baltimore Maryland. He studied portraiture with the painter Thomas Sully from 1831 to 1832. He then traveled to Paris in 1833 to study at the École des Beaux-Arts and later at the English Life School in Rome. When he returned to America, he opened a portrait studio in Baltimore but had limited success. 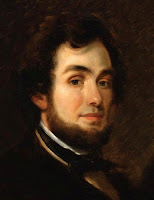 In 1837 he moved to New Orleans, where he encountered Sir William Drummond Stewart, a Scottish nobleman who had served with distinction at the battle of Waterloo 20 years earlier. Stewart had come to America to experience the allure of the Transmississippi West. Stewart was preparing for his fifth trek west to attend the annual rendezvous of trappers at Horse Creek in the Wind River Mountains in Wyoming. Stewart immediately admired Miller's work and invited him to join his expedition to record its exploits. Although Miller spent more than six months in the West, the number of works he actually produced while on this trip is relatively small -- probably less than 100. Shortly after his return to Baltimore in the autumn of 1837, Miller reworked his field sketches into an album of 87 watercolors for Stewart. After Miller finished the sketchbook, he journeyed to Scotland to paint at least ten large oils for Stewart at his ancestral home, Murthly Castle. The work that he created for his patron featured Stewart at the center of the action: leading the expedition, hunting on the prairies, or engaging in acts of diplomacy with the Indians. Returning to America, Miller spent the rest of his life painting and repainting nearly 1,000 works of the western genre for Baltimore's patrons and citizens until he retired in 1872. He developed patronage among Baltimore merchants whose business interests included the American West, men who sought the frontiers of opportunity that the West presented and who were willing to invest their resources there. For these patrons, Miller painted his subjects in a stylized, romantic, and sentimental manner, capitalizing on the prevalent tastes and trends of his time by drawing from the story lines and characterizations that could be found in the popular literature of the day. The first sculpting project will be a trapper reconstructed using the art of Jacob Miller. I think this is a very interesting idea sculpting a figure based on another artists vision. I look forward to seeing this progress. Jim, As you'll see in the next posting or two Miller's mountain men, trappers, what have you were not your stereotypical Hollywood types. This is what drew me to Miller's work. I think the work of early American painters are a great reference in terms of not only the look of people at that time but their clothing and surroundings as well.